It is known, Vaclav Vyborny bought a house in Klatovy in 1597 (#137 in the present Kramerius Street). He bought it from Hons the tailor for 100 kops. The house was as his possession still in 1619. Vaclav's widow has kept it until 1640. During the 30 year's war Klatovy suffered greatly - the citizens had to pay a lot to the Emperor's army and they had to be re-catholized. 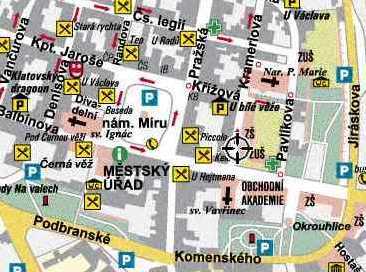 In 1636 the Jesuites came to Klatovy. They have settled in one town's house which they adapted as the school and the college. The number of classes there increased from one to six during 1636-1647. Lack of space was the reason for the Jesuites to consider building of a greater college and school. The houses around the Black Tower and the Church were confiscated for this purpose. left - The Jesuit College of Klatovy: the "Black Tower" at the center of the picture. The former Jesuit College on the right from the Tower. One of the spires of the Jesuit church seen behind the former Jesuit Latin School on the left from the Tower. The picture can be enlarged by clicking on, even greater format 56 kB here. Other pictures of this College here. where an another complex of the Jesuit college, school and estates has been built since 1633. The Emperor allowed to build this [=of Kutna Hora] college even in 1624 and has granted the Jesuites with the [war] confiscated estate of Kresetice to which belonged the surrounding villages: Kresetice, Predborice, Krasinovicky, Krupa, Perstejnec, Neskaredice, Bylany, Pabenice, Chrast and also the yards in Pritoka, Pucher and this one directly in the village of Kresetice. The pater Jan Loubsky was the Rector of the K.Hora's Jesuit College in 1651. He wrote the list "Societatis Jesu" of persons being in service for the College at the yard of Kresetice on Mar 19, 1651. He had to prepare it according the Decree of Nov 16, 1650 ordering all the district representatives throughout the Bohemia to list all the inhabitants according the (catholic) religious faith. The obligate columns of such lists were: name - position - job - religious faith. These lists are the second the most important archive source of the half of 17th century, completing so called "Berni rula" from 1654. The latter listed the owners of some property, however, only. According to the above mentioned list of the persons working for the K.Hora Jesuit College the following 6 professions were included there: a cook, a baker, a shoemaker, a tailor, a stoker, a gardener. As the gardener certain Vaclav of Klatovy was listed there. He was described as a free-man ["non-subject to anybody"], aged 46 which corresponds to the birth around 1605. Together with him his wife Katerina [Catharina] the washer-woman aged 31 and his son Tomas aged 2 lived in the houses belonging to the College. They had even other children, probably - those aged over 7 were included in this list only, however. The reason of the exclusion in the case of Thomas is not known - it could be because some mistake, too, perhaps. This hypothesis might be supposed to be too beautiful to be true. But, in fact, no points have been found, so far, to be in a contradiction to cancel this hypothesis. 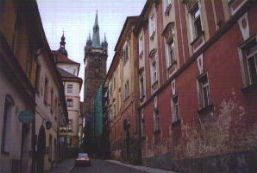 It would be desirable to inspect the Regional Archive in Klatovy: the town's archive since 14th century or the archive of the tailor's guild and the archive of the Jesuit College of Klatovy (if it still exists). The further search should concern to the K.Hora registers, again. It should be checked for any occurence of the surname KLATOVSKY [= of Klatovy - in Czech], whether of the first name Vaclav or of any other. Also notes about all the persons named Frydrich should be excerpted and possible dependences considered. The coincidence of ages [of (12Vaclav*1605)'s children to 11Frydrich*1645/1649] is surprizing. It would be useful to search the K.Hora registry book (in the State Regional Archive Prague) again for all the Frydrichs there. In fact this Frydrich "Wegborneg" need not to be of such name since the very beginning. KRYSTOF BEDRICH [= Christopher Frederick] or TOMAS BEDRICH [=Thomas F.] could have been used well as alternative names. He could have been baptized by the Jesuites again and he could obtain two names such a way. It is remarkable the name Frydrich has not been used within the Vyborny family any more. It gives certain evidence, too.